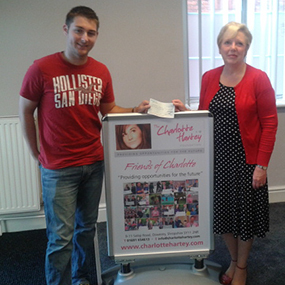 The Charlotte Hartey Foundation happily donated a cheque for £1,000 to Chris Richter, 19 years of age, of Oswestry to support his adventure in Saskatchewan, Canada. Chris will be joining Soul Edge for 5 months in Saskatchewan, Canada. Soul Edge is an adventure-based leadership training course focusing on equipping and empowering young men and women to rise up as a generation of leaders capable and passionate about bringing change and impact to the world around them. Chris’s adventure will include winter sports, development of the Christian faith, as well as playing the guitar and singing. 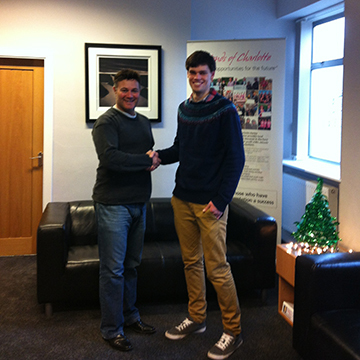 The Charlotte Hartey Foundation wishes Chris well on his journey. Pam Parish wrote on behalf of the Homework Club at Oswestry Library requesting a donation towards financial support for the Homework Club at Oswestry Library. Pam said the club costs a total of just £2000 per year to run as expenses such as computers, management and staff training costs, printing and photocopying are kindly met by the library service. The Homework Club needed to have found sufficient funding by the end of September in order to secure the club until summer 2014, or else they would be under pressure to serve a redundancy notice which would impact on the children who attend the club. 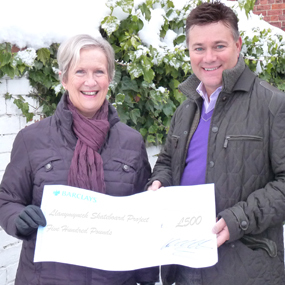 A £500.00 cheque was presented to Pam Parish from Tristan Hartey on behalf of the Charlotte Hartey Foundation. An example of the kind of local work they are doing in Oswestry is the small group tuition which co-ordinator Karen Paes is offering to a number of migrant children attending Holy Trinity Primary School. Valuable small group reading and numeracy support is needed now, to improve their opportunities at secondary school. Other successes have included support for young people with academic, social and emotional difficulties, and providing a safe, welcoming venue for a group of pupils from local primary schools to complete their homework using library facilities. We will use the donation to fund our Cyprus swimming camp in October 2014 and will use this for the swimmers that are not as financially fortunate as some of the others that will be going. When we had our first donation Mr Hartey mentioned that he would assist in the future and this is the second donation that we have kindly had from the Foundation. Annually a trophy is given to someone in the club who has achieved or contributed the most in the past year at our presentation night in September, I mentioned to you that we would like to name this trophy the ‘ Charlotte Hartey Achievement Award’ as a thank you for all the help so far. The whole ethos of the club is built around young people trying to strive to achieve their best and although none of us have been in the tragic situation that Mr Hartey has been in, I hope that knowing something beneficial and memorable can be produced is of some consolation. You may remember reading about Anthony Gillam from Criftins Bowling Club back in January and their efforts to raise enough money to buy and install a new irrigation system for the green. 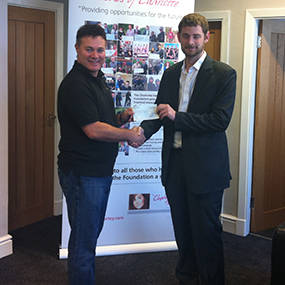 After months of fundraising, they have managed to raise a total of £2500, £400 short of their target and so Anthony re-approached the Foundation to ask if we could make a further donation to enable them to reach their total. We are pleased to announce that the Foundation has donated the remaining £400 and look forward to seeing the improvements the new irrigation system will make to the green. We wish Anthony and each member of the bowling club a successful upcoming season! 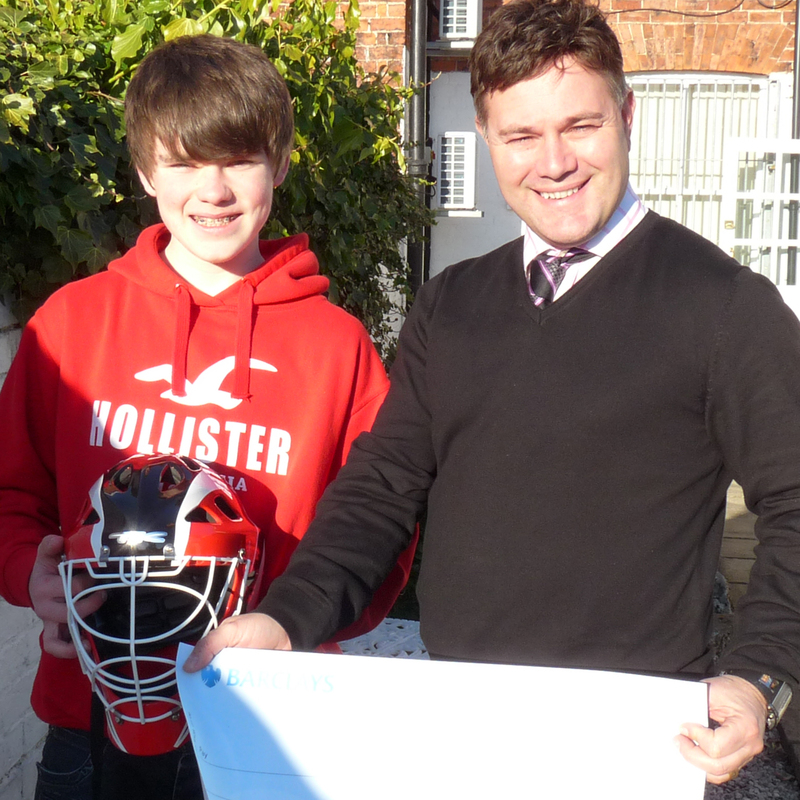 The Charlotte Hartey Foundation has donated £160 to a local lad with a talent for hockey. Callum Williams plays for Oswestry Hockey Club, Shropshire County Hockey and Cannock Hockey Club and is also due to play for Cannock in the England Boys U14 competition in April 2013. Callum’s Mother Sam Williams wrote to the Foundation to ask for a donation towards a new helmet as his existing helmet recently took a hit, which caused a crack to appear, leaving his helmet unsuitable for the level of hockey he plays at. Callum is delighted with his new helmet and we wish him luck for the forthcoming regional tournaments. 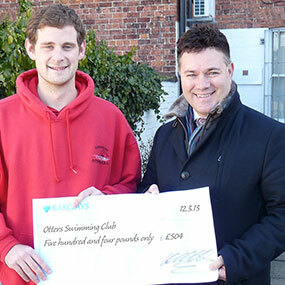 Phil Chapman wrote to the foundation on behalf of Oswestry Otters A.S.C in the hope that the foundation could provide funding for a child that is unable to afford the annual fees. The foundation embraced the offer of providing the scholarship by gifting £504 giving a child the opportunity to reach their full potential, on opportunity that they would not normally have. Phil said: "The scholarship money will be put to good use and some serious thought will be put to the deserving candidate. There are so many occasions where true talent is not allowed to surface due to the simple fact of costs. This is a wonderful opportunity for a talented young individual to not miss out and hopefully progress to the next level of their ability. I am very grateful to the foundations generosity". 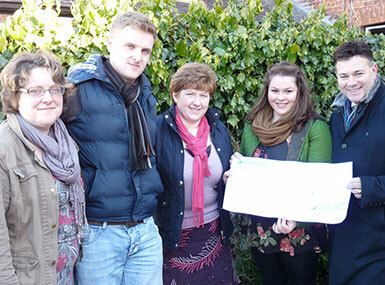 The Foundation recently gifted £500 to the Dyffryn Tanat Young Farmers Club Theatre Group catering for budding young actors aged between 13-26. Maralene Griffiths wrote to the foundation asking for a donation towards the unseen costs of producing the play 'Missing Dan Nolan', based on the true tragedy of Dan who went missing on 2002. The costs of putting on a performance include purchasing copy right fees, costumes, set, props, travel etc. The group performed at Theatre Hafren, as part of the Montgomeryshire YFC DRAMA competition festival, and were successful in winning the competition. Having won they progressed to Swansea Grand Theatre for the next stage to attempt to win a place to represent Wales in May 2013.The group rose to the occasion and came third in Wales with one best actress nomination Linwen Thomas, and one of our actors Gethin Bickerton age 17, who won best overall actor. Marlene said: "The group was so thankful to the foundation for their donation and look forward to producing other winning performances with such a talented group of youngsters". Sue Heard, a youth leader from St Martins Youth Club accepted a donation from the Charlotte Hartey Foundation for £400 to be put towards a new table-tennis table. 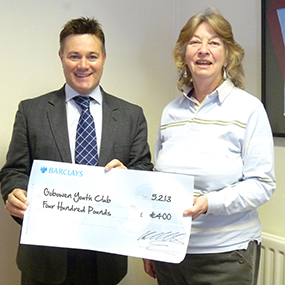 Along with her husband Nick, Sue has been a volunteer for the Club since it started, nearly 20 years ago. The Club originally formed in 1993 at St Martins Church but has since moved twice, firstly to the St Martins Scout Hut and finally to The St Martins Centre in 2004. Sue says “the Club meets every Friday evening and is currently attended by almost 40 young people”. As well as their new table-tennis table, there are many other activities to be enjoyed, such as table football, pyrography, cooking, PS2 & Wii games, pool, art and use of the computer room. 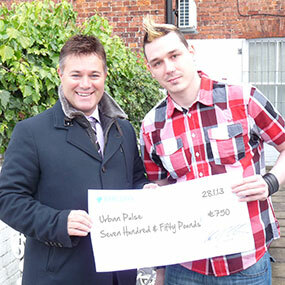 Urban Pulse has received a cheque from Karl Hartey of the Charlotte Hartey Foundation. The CHF is the first organisation to offer support to a new project in Oswestry aimed at engaging with 10 to 19 year olds and forming them into a “street band” that uses everyday objects like buckets and dust bins as percussion instruments to perform a unique style of music and dance. The project is being coordinated by Jay Moore of Fusion Arts Oswestry (FAO), based at The Centre on Oak Street, Oswestry's new facility for young people. Jay is a professional drum teacher and one of the founders of FAO; he has taken on the percussion tuition for the project. Funding is crucial to the success of this initiative, so if any companies in the area would be interested in sponsoring the project, please get in contact and we will be happy to answer any questions you may have. Any young people who would like to participate in this exciting opportunity, please visit our website www.urban-pulse.co.uk and use the contact page, email us on urbanpulse.sy11@yahoo.co.uk or call Mike on 01691 650854. Carol Jones, Llanymynech Youth Club Leader, wrote to the Foundation to ask for a donation towards a projected skate-park on Llanymenech playing field. Last summer, the "Ramped" mobile skate-park equipment proved to be incredibly popular, with over 30 youngsters thoroughly enjoying the experience the skate-park provided! Since then, a group of them have made a presentation to the local Parish Council to request a permanent skate-park. As well as being supported by the local Parish Council, the youngsters have already raised £300 by themselves with a sponsored scooter ride around Lake Vyrnwy and by selling knitted socks filled with chocolate Santa's at their pantomime! Carol says "they are a very enthusiastic group who are often seen around the village performing their tricks. It would be great if they had a permanent skate-park to enable them to practice their sport in safety".